A new dinosaur, Ceratonykus oculatus gen. et sp. 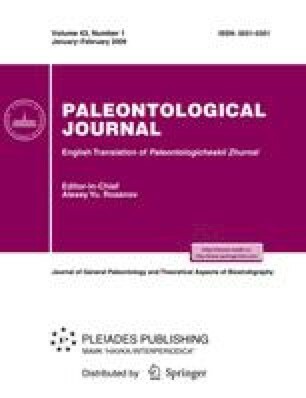 nov. (Parvicursoridae, Alvarezsauria), from the Upper Cretaceous (Baruungoyot Formation) of Mongolia is described based on a fragmentary skeleton. It differs from other alvarezsaurians in many characters, including the short femora, long tarsometatarsals, and considerably reduced third metatarsals. The carpometacarpals contain spikelike bones. The natural endocast of the new taxon shows large acoustic tubercles, the ventral position of the optic lobes in the midbrain, and the absence of a vertical flexure at the brain floor. The data obtained cast doubt on the taxonomic position of alvarezsaurians in the Theropoda. Original Russian Text © V.R. Alifanov, R. Barsbold, 2009, published in Paleontologicheskii Zhurnal, 2009, No. 1, pp. 86–99.